The Weinstein Company (TWC) have announced a USA Thanksgiving week release date of Nov. 25 , 2016 for LION, starring Rooney Mara, Nicole Kidman and Dev Patel. The Friday after Thanksgiving is historically a hot spot for TWC when it comes to platforming its awards season fare. The November date is where Carol, The Imitation Game and The King’s Speech launched in recent years. Mara recently landed her second Oscar nomination and won best actress at the Cannes Film Festival for TWC‘s Carol. “We are very excited for LION coming out this season. This touching and beautiful family story has tremendous performances by Dev Patel, Nicole Kidman and Rooney Mara and will work really well during the holiday season,” said Harvey Weinstein. 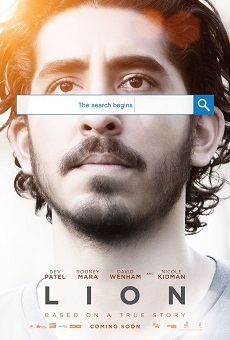 Lion is the Tasmanian/Indian true story about adopted orphan Saroo Brierley, who used memory and Google Earth to work out where his family lives in India. Garth Davis is directing from a Luke Davies script, propelled into feature films by his co-directing on Top of the Lake and his awarded, international level career as a TVC maker. The producers are the Oscar winning (Kings Speech) See-Saw team of Emile Sherman and Iain Canning, with Angie Fielder. The executive producers are Andrew Fraser and Shahen Mekertichian of Sunstar Entertainment, who optioned the story. Sunstar Entertainment is also credited as co-producers with See-Saw Films. A Lion release date for the Australian market is expected to be announced soon.